Fat is one of the most beneficial substances in your diet, and it is often the missing link in developing and maintaining good health and ultimately optimum performance. But a misunderstanding of the role of fat and a well financed misinformation campaign has misled the public and led to an epidemic of fat phobia. Just think of the amount of money spent each year on low fat and no fat food and you’ll understand why you might not have been told the whole truth about fat. Fat sources like vegetable oil, butter, fats in eggs, meat and cheeses and other naturally occurring fat can be harmful if over eaten. In fact, too much or too little is dangerous and hence the importance of understanding the role of fat and ultimately your personal needs for optimal health and performance. Consuming a balanced amount of healthy fat helps maintain health, prevent disease and facilitate optimal performance. Eating too much of one type of fat, saturated fat, or too much omega 6 from vegetable oil can disturb the delicate balance of fat in the body. Eating processed fats, such as hydrogenated oil, and overheated fat, such as a fried food, causes dysfunction and disease. This means many mainstream foods and snacks are out: chips, french fries, and fried chicken. The aerobic system depends on fats as the primary fuel for the aerobic muscles, which power us through the day. Fat produces energy and prevents excessive dependency upon sugar, especially blood sugar. Fats provide more than twice as much potential energy as carbohydrates do because fat contains 9 calories per gram in comparison to 4 calories per gram of carbohydrate/sugar. Your body is capable of obtaining most of its energy from fat, up to 80 to 90%, if you’re fat burning mechanism is working efficiently. The body even uses fat as a source of energy for heart muscle function. These fats, called phospholipids, normally are contained in the heart muscle and generate energy to make it work more efficiently. What happens if you have not trained your body to use fat as your primary fuel source? Then you must use more sugar for energy. Low blood sugar symptoms include: mood swings, mental or physical fatigue, clumsiness, headaches, depression, allergies and other physical and mental challenges, depending on your susceptibility to an excess or deprivation of sugar in the blood. How can you avoid these sugar highs and sugar lows? By making sure you train your body to burn fat for energy. If your body is burning fat for energy while you exercise, your brain and nervous system will have enough sugar, which they require for energy. If the rest of your body takes too much of the brain’s energy supply of sugar (from your liver & muscles), the brain will not function at peak performance and neither will the rest of your body. A second reaction to the body not having enough balanced fat for energy is that it will store fat. The body likes fat, think of all the foods with a high-fat content that you like to eat. Actually, the body likes fat so much; carbohydrates and proteins can be converted and stored as fat. In fact, the body stores fat in case fat is needed in the future- that could be tomorrow, next week or next month. Let’s take a look at some of the various body functions that require fat. The hormonal system is responsible for controlling virtually all healthy functions of the body. For the hormonal system to function properly, the body must produce proper amounts of the appropriate hormones. 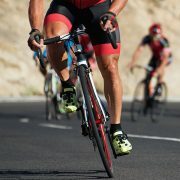 Many glands, such as the adrenal glands, are dependent on fat for production of hormones according to Dr. Maffetone, well renowned author and coach to Mark Allen, six-time Ironman World Champion. In addition to the adrenal glands, the thymus, thyroid, kidneys and other glands use fats to help make hormones. The adrenals also require a specific fat, cholesterol for the production of hormones such as progesterone and cortisone. The thymus gland regulates immunity and the body’s defense systems. The thyroid regulates body temperature, weight and other metabolic functions, the kidneys hormones help regulate blood pressure, circulation and filtering of blood. Many people are rightly concerned about their percentage of body fat. But hormonal problems, and the related health problems that stem from them, can be seen in those who have fat imbalances or whose body fat is too low. For example, some women who exercise too much experience disruptions in their menstrual cycle, usually indicating a fat metabolism disorder. Many women also except the popular misconception of menopause is always accompanied by significant symptoms. In reality, women with properly functioning hormonal systems have only minor symptoms. Many women on a low-fat diet, or who have a history of following a low-fat diet and have not corrected fatty acid imbalances or deficiencies, experienced significant menopausal complaint bees often are related fatty acid deficiency. Without the right balance of fats in the system, the hormonal system can produce certain hormones. Hormone like substances, called eicosanoid, are necessary for normal cellular functions such as: regulating inflammation, hydration, circulation and free radical activity. Produced from dietary fat, eicosanoid are especially important for the role in controlling inflammation – the precursor to many chronic diseases including cancer, heart disease and Alzheimer’s according to Dr. Maffetone. Many people have inflammatory conditions such as arthritis, tendinitis and anything ending with “-itis” probably have an eicosanoid imbalance. But in many people, chronic inflammation goes on unidentified. The balance of eicosanoid is also important for regulating blood pressure and hydration. An imbalance can produce high or low blood pressure or trigger constipation or diarrhea. Eicosanoid imbalance may also be associated with menstrual cramps, blood clotting, tumor growth and other problems. The body’s ability to store fat permits humans to live in most climates, even those of extreme heat or cold. In areas of warmer conditions, stored body fat provides protection from the heat. In cooler areas, increased fat storages below the skin prevents too much heat from leaving the body. In warmer climates, fat prevents too much water from leaving the body, which can result in dehydration that causes dry, scaly skin. Because so many people digest food poorly – a common result of stress, they do not always absorb the nutrients in foods. Your diet may be the best in the world but it’s all for nothing if you can’t properly digest and absorb the nutrients they contain. Bile from the gallbladder triggered by fat in the diet, helps aide in the digestion and absorption of fats and fat soluble vitamins. Most of the fats and the diet are digested in the small intestine – this process involves breaking the fat into smaller particles. The pancreas, liver, gallbladder and large intestine are also involved in the digestive process. Any of these organs not working properly could have a negative effect on fat metabolism in general, but the two most important organs are the liver, which makes bile, and the pancreas, which makes the enzyme lipase. If there is not enough fat in the diet, not enough bile will be secreted according to Dr. Maffetone. The secretion of bile into the small intestine makes your dietary fat digestible. Certain lipase containing foods such as avocados & extra virgin olive oil can greatly aid digestion of fat. Fat also helps regulate the rate of stomach emptying. Fats in a meal slow stomach emptying, allowing for better digestion of protein. If you’re always hungry, it may be because your meals are too low in fat and your stomach is emptying too fast. Fats also slow the absorption of sugar from the small intestine, which keeps insulin from rising too high or too quickly. Additionally, fats protect the inner lining of the stomach and intestines from irritating substances in the diet, such as alcohol and spicy food. Fat offers physical support and protection of vital body parts, including the organs and glands. 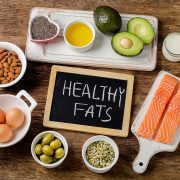 Fats acts as a natural, built in shock absorber, cushioning the body and various parts from the wear and tear of everyday life and helps prevent organs sinking due to the downward pull of gravity. Most people know that vitamin D is produced by exposure of the skin to the sun. However, it is actually cholesterol in the skin that allows this reaction to occur. Sunlight chemically changes cholesterol in the skin that allows this reaction to occur. Sunlight chemically changes cholesterol in the skin through the process of irradiation to vitamin D-3. This newly formed vitamin D is then absorbed into the blood, allowing calcium and phosphorus to be properly absorbed from the intestinal tract. Without the vitamin D, calcium and phosphorus would not be well absorbed and deficiencies of both would occur. But without cholesterol the entire process would not occur as outlined by Dr. Maffetone. There’s another important connection between calcium & fat. Calcium needs to be carried from the blood and taken into the bones and muscle cells. For this to happen, certain prostaglandins, made from fat, are needed. If there is not enough fat to make adequate prostaglandins, too little calcium enters the bone. When this happens, the results can be stress fractures, osteoporosis and collapsed vertebrae. Without enough calcium in muscles, tightness, spasms or cramping can occur since calcium is needed to relax muscles. Unused calcium may be stored, sometimes in the kidney’s as stones or in the muscles, tendons or joint space as calcium deposits, often called bone spurs. Besides vitamin D, other vitamins including A, E and K rely on fat for proper absorption and utilization. 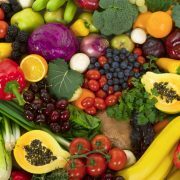 These important vitamins are present primarily in fatty foods, and the body cannot make an adequate amount of these vitamins to ensure continued good health. Additionally, these vitamins require fat in the intestines in order to be absorbed. With this in mind, a low fat diet could be deficient in these vitamins to begin with and also could further restriction their absorption. Face it, people love food with fat in them but are too guilt ridden to enjoy the food they are eating. Fat does not have to be an unhealthy addition to your diet if properly balanced. Fat not only tastes good, it makes you feel good both physiologically and psychologically as well. Fat (along with protein) satisfies your physical hunger. People on low fat diets often claim that they are always hungry. Of course they are, without fat in their diet they can’t achieve the feeling of satiety. And as a result, the brain just keeps sending the same message over and over “Eat More”. Because you never really feel satisfied, the temptation to over eat is irresistible. In fact, there’s a good chance you can actually gain weight on a low-fat diet by overeating trying get that “I’m not hungry anymore feeling”.